I recently ran a project with the 2nd year BA (Hons) Spatial Design at the London College of Communication (University of the Arts London) where, in collaboration with South West Trains in Wimbledon station, students were asked to re-examine the way people inhabit a transition space. 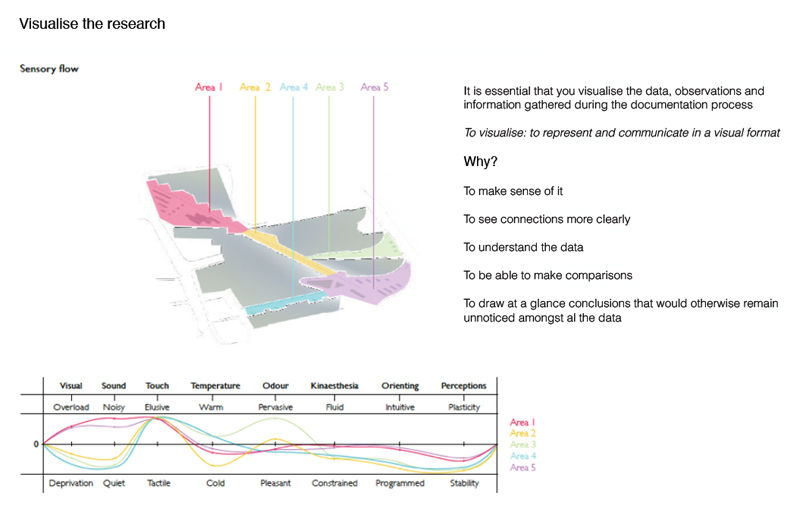 As part of the project, students were introduced to research methods I had previously developed to facilitate the documentation of atmospheric qualities in spaces, and visualise the intangible world of sensory perceptions and subjective experiences. The objective of my research was to enable designers to conduct sensory driven transformation into a wide range of spaces. The original research was published in a paper called ‘Sensing the Urban Interior’ and presented at the [in]arch conference at Universitas Indonesia in Depok (Jakarta) in 2014. How can we regenerate spaces by manipulating their atmospheric qualities? It explored the sensory relationships between the intimate space of the body and the interior of a transition space, the ubiquitous train station. Every morning, Monday to Friday, our cities experience an influx of people commuting towards their center to work and reversing their journey to go back home in the evening. This creates a social phenomenon whereby the experience many people have of the city’s urban interiors is transient. This experience is also impersonal as the design of the spaces that facilitate this daily commute is often constrained to performing specific functions such as moving people from A to B, with limited opportunities for people to interact with their surroundings and even less so with each other. So the train station is an interior commuters experience and inhabit on a daily basis yet very little of the design takes into account the way the space affects people, psychologically and emotionally. Therefore, the objective of the project is to understand how these environments impact on people’s everyday life by exploring and identifying the processes in which sensory experiences are managed and controlled, in order to develop a human centred phenomenological approach to the design process and in doing so, offer innovative solutions that alter the way people perceive, experience and inhabit these interiors. So the project invited students to rethink the relationship between body and space in the context of a transition space, provide sensory driven transformations that alter the atmospheric qualities of the interior in a positive way and create a sense of place, thus making the experience of individual and collective journeys a more enjoyable one. This entry was posted in Atmosphere, Perceptions, Spatial Experience and tagged atmosphere, inhabiting the transition space, research in education, sensory perceptions, Spatial Experience, subjective experiences, visualising research, Wimbledon train station. Bookmark the permalink.